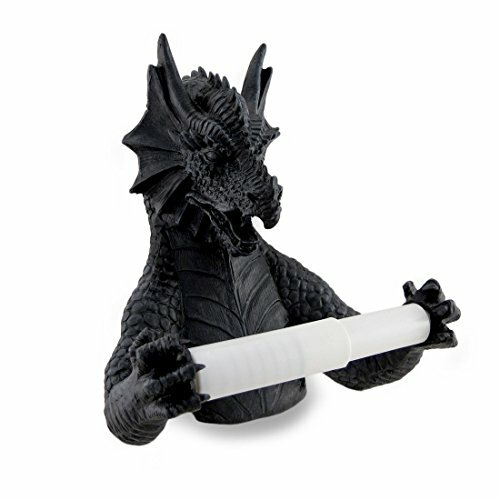 Imagine the surprise on your guests faces when they see this amusingly demonic dragon toilet paper holder in your bathroom! 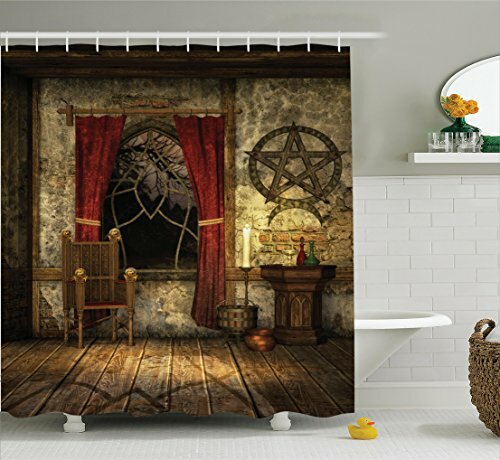 This metallic look decoration for your dungeon bathroom is so chillingly detailed, it may just give you a fright in the middle of the night. A great gift for collectors of medieval and Gothic décor sculptures and artwork. Holds any standard size roll of toilet paper. There are three holes on back for mounting and a set of mounting screws is included. Anchors are not included, but are recommended for mounting on most typical bathroom walls. Designed to be long enough to cover up the existing screw holes of most standard size toilet paper holders. 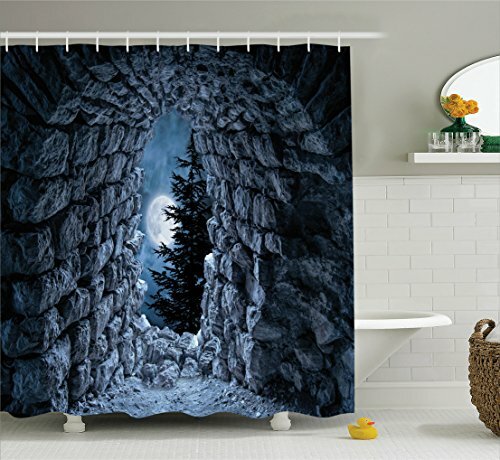 Could your bathroom use a bit of medieval fantasy ambiance? 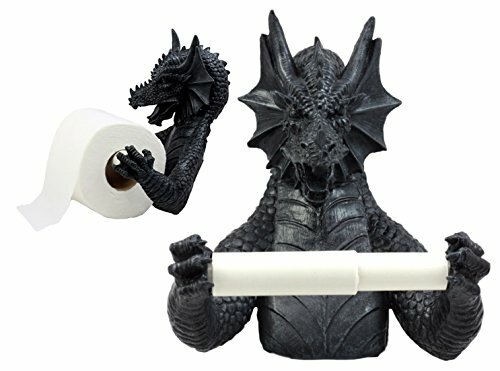 This Dragon toilet paper holder will bring you right into the heart of the terror!!! This Dragon wall mounted toilet paper holder measures 8.5" tall, 7" long and 4.5" deep approximately. 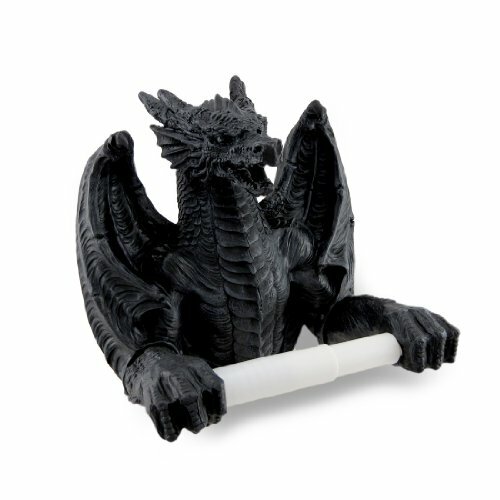 This Dragon wall mounted toilet paper holder is individually hand-crafted from cold cast resin with plastic roller and metal mounting plate. Toilet paper not included. Because our polyresin products are individually hand-crafted, colors may vary slightly from what is pictured here. This evil skeleton grins every time the toilet paper spins! 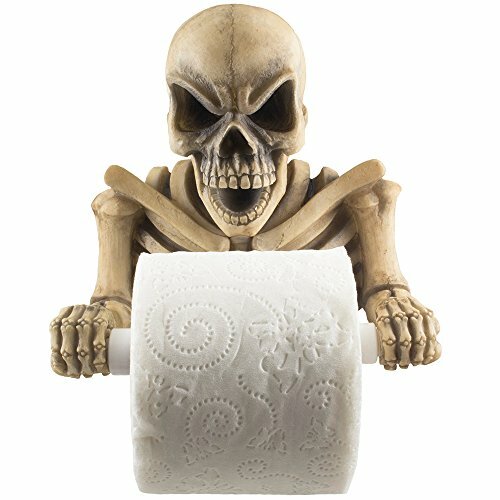 This scary toilet paper holder serves as a bone chilling Halloween decoration or everyday addition to your medieval or Gothic bathroom décor. Sturdy construction and exquisite detailing turns this sculpture into a wall plaque with function that's a dream come true for the most daring decorator! Makes a great novelty or fantasy gift idea. This decorative toilet paper holder includes 3 mounting screws. If mounting to drywall, using screw anchors is highly recommended (not included). Designed to be long enough to cover up the existing screw holes of most standard size toilet paper holders. This medieval winged dragon will guard your bathroom bounty with Gothic flair! Expertly cast in resin in amazing detail with an awesome cast iron finish, this scaly tissue tyrant comes to aid in your time of need! It easily mounts to the wall using the included hardware, and accommodates a single roll of tissue (not included). It`s a fantastical addition to your private castle befitting of any throne! This unique 9 inch (23 cm) high, 9 inch (23 cm) wide, 5.5 inch (14 cm) deep sculptural commode dragon toilet tissue holder makes a gift any dragon lover would be proud to display! Claim the throne as your own! Our Toscano-exclusive, wall-mounted toilet tissue knight is cast in quality designer resin and hand-painted to capture every amazing detail of his Medieval mannerisms. Our protector of the realm is "at your service" to hold your standard-size tissue. Sorry, bath tissue not included. Due to the nature of this item, we are unable to accept returns. 9"Wx13"Dx7"H. 5 lbs. Guard your bathroom bounty with Gothic flair with the help of this medieval style toilet tissue valet! Expertly cast in resin in amazing detail with an awesome cast iron finish, this scaly tissue tyrant comes to aid in your time of need! It easily mounts to the wall using the included hardware, and accommodates a single roll of tissue. It`s a fantastical addition to your private castle befitting of any throne! This unique 8 inch (20 cm) high, 7.25 inch (18 cm) wide, 4.25 inch (11 cm) deep sculptural commode dragon toilet tissue holder makes a gift any dragon lover would be proud to display! 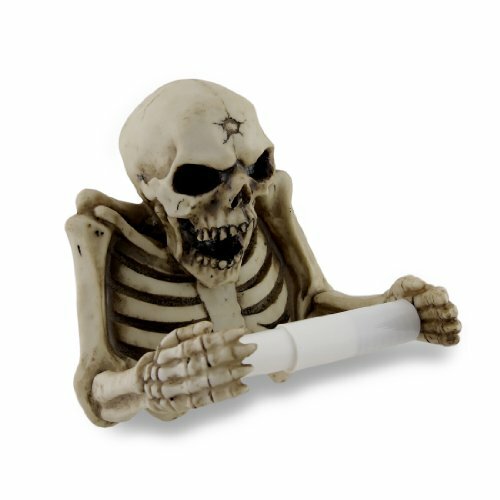 Perfect for the throne of any Gothic lair, this awesome bony skeleton comes to aid in your time of need! Expertly cast in resin, this realistically hand-painted 8 inch (20 cm) high, 8 inch (20 cm) wide, 6.5 inch (17 cm) deep macabre skeletal figure accommodates a single roll of tissue (not included), easily mounts to the wall using the included hardware, and adds a creepy touch sure to make your guests do a double take! 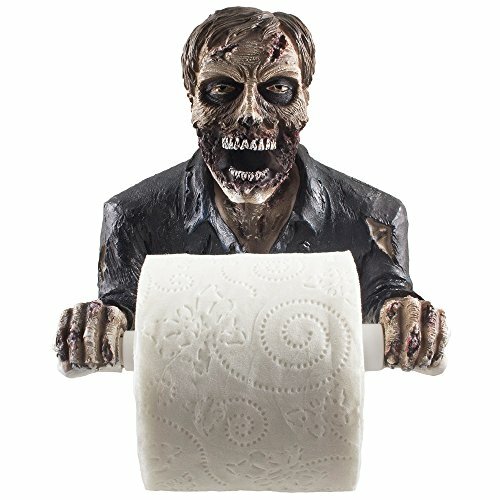 Literally scare the sh*t out of your bathroom visitors when they notice this spooky undead zombie toilet paper holder hanging on the wall! Featuring solid construction and fine detailing, this decorative wall art accent piece is a one-of-a-kind Halloween decoration or scary everyday bath accessory that will have your guests laughing. Also makes a great novelty gift idea for collectors of medieval and Gothic décor. This whimsical toilet paper holder includes 3 mounting screws. If mounting to drywall, the use of screw anchors is highly recommended (not included). Designed to be long enough to cover up the existing screw holes of most standard size toilet paper holders. Queen in golden tub. Color 16mm film excerpt from short film IN TIME. These toilet sets were found in almost every time period, made out of almost any metal available. So it's a must have for a pre-medieval enthusiast! 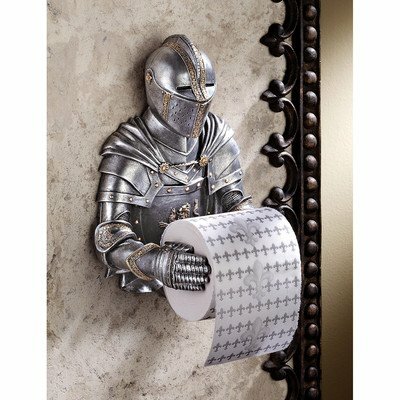 Compare prices on Medieval Bathroom Accessories at ShoppinGent.com – use promo codes and coupons for best offers and deals. Start smart buying with ShoppinGent.com right now and choose your golden price on every purchase.